Travis Calvin Jackson (November 2, 1903 – July 27, 1987) was an American baseball shortstop. In Major League Baseball (MLB), Jackson played for the New York Giants from 1922 through 1936, winning the 1933 World Series, and representing the Giants in the MLB All-Star in 1934. After his retirement as a player, Jackson managed in minor league baseball through to the 1960 season. Jackson was discovered by Kid Elberfeld at a minor league baseball game at the age of 14. Elberfeld signed Jackson to his first professional contract, and recommended him to John McGraw, manager of the Giants. His exceptional range at shortstop led to the nickname "Stonewall." Jackson was inducted into the National Baseball Hall of Fame in 1982. Jackson was born in Waldo, Arkansas on November 2, 1903. He was the only child of William Jackson, a wholesale grocer, and his wife, Etta, who named their son after William B. Travis, a Lieutenant Colonel who died at the Battle of the Alamo. His father bought him a baseball when he was three years old, and they often played catch together. Jackson's uncle took him to a game of the Little Rock Travelers, who played minor league baseball in the Class-A Southern Association, when Jackson was 14 years old. At the game, Jackson's uncle introduced him to Kid Elberfeld, telling Elberfeld that his nephew was a talented baseball player. Elberfeld observed Jackson in an impromtu work out, and asked Jackson to contact him when he was ready to begin his professional career. Jackson attended Ouachita Baptist University in Arkadelphia, Arkansas, where he starred on the college baseball team. He injured his knee in college, and this injury would recur during Jackson's career. Following Jackson's collegiate career, Elberfeld signed Jackson to his first contract, and he played for Little Rock in 1921 and 1922. Jackson committed 72 errors during the 1922 season, which he considered the "world record for errors". "I guess I set a world record for errors. I had a pretty good arm, see, but I didn't have much control. A lot of those were double errors — two on the same play, a boot and then a wild throw. The people in the first-base and right-field bleachers knew me. When the ball was hit to me they scattered. 'Watch out! He's got it again.'" Despite this, Elberfeld recommended Jackson to John McGraw, manager of the New York Giants of the National League (NL), who was entitled to a Travelers' player as he had lent a player to the team in 1922. McGraw signed Jackson to a contract on June 30, effective at the end of the Southern Association's 1922 season. Jackson debuted in MLB with the Giants on September 22, 1922, appearing in three games. With Dave Bancroft and Heinie Groh, the Giants starting shortstop and third baseman respectively, sidelined with injuries in during the 1923 season, Jackson drew notice as a fill-in. McGraw was confident enough in Jackson's abilities to trade Bancroft before the 1924 season, choosing Jackson to be the Giants' starting shortstop. Though there was doubt that Jackson could adequately replace Bancroft, Jackson played in 151 games during the 1924 season and hit .302 with 11 home runs. The Giants lost the 1924 World Series to the Washington Senators, with Jackson committing a key error in Game 7, which contributed to Washington's victory. Jackson was considered one of the best active shortstops in baseball during his career; he led NL shortstops with a .970 fielding percentage in 1931. However, he missed considerable playing time in his career due to injuries and illnesses. Jackson reinjured his knee in 1925, missed significant time as a result of his knee during the 1926 season, and had surgery for appendicitis during the 1927 season. He missed time with mumps in 1930 and influenza in 1932, and he continued to battle knee problems, missing much of the 1932 and 1933 seasons. Jackson was said to "at 28, already [have] one foot in the minors". Despite this, manager Bill Terry said that Jackson would "make or break" the 1933 season. 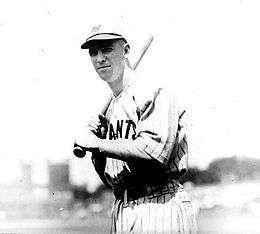 Though Jackson fell behind Blondy Ryan on the team's depth chart during the season, he returned in the 1933 World Series, which the Giants won over the Senators. Terry stayed with Jackson as the Giants' starting shortstop for the 1934 season, in which he drove in 101 runs, and was named to appear in the 1934 MLB All-Star Game. He played as a third baseman in his final two seasons, serving as team captain, although he struggled in the 1936 World Series, which the Giants lost to the New York Yankees. After the season, the Giants requested waivers on Jackson, in order to assign him to the minor leagues. Jackson was regarded as one of the premier defensive shortstops in the league. He batted over .300 six times, including a career-high .339 in the 1930 season, and hit 21 home runs in 1929. 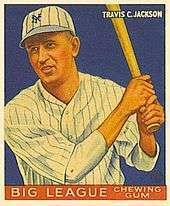 He was on four NL pennant-winning teams and one World Series champion (1933). Jackson finished his MLB career with 135 home runs and a .291 batting average. Jackson signed a three-year contract with the Jersey City Giants of the Class-AA International League after the 1936 season. The team, which the Giants had purchased to become their farm team that offseason, was moved from Albany, New York, with Jackson to serve as player-manager. Jackson's knees prevented him from appearing in many games with Jersey City as a player, but he remained as the team's manager until July 1938, when he was replaced with Hank DeBerry. The Giants brought Jackson back to MLB as a coach for the remaining 18 months on his contract, succeeding Tommy Clarke, who became a scout. Jackson missed the next five baseball seasons as he battled tuberculosis, eventually returning to manage in the Boston Braves/Milwaukee Braves system for the Jackson Senators in the Class-B Southeastern League in 1946. Jackson returned to the Giants to coach in 1947 and 1948, receiving his unconditional release following the 1948 season. Returning to the Braves' minor league system, Jackson managed the Tampa Smokers of the Class-B Florida International League in 1949, but resigned in July during a losing streak. He managed the Owensboro Oilers of the Class-D Kentucky–Illinois–Tennessee League in 1950, and began the 1951 season managing the Bluefield Blue-Greys of the Class-D Appalachian League, but was reassigned to the Hartford Chiefs of the Class-A Eastern League when Hartford manager Tommy Holmes was named Braves' manager. Jackson managed the Appleton Papermakers of the Class-D Wisconsin State League in 1952 and 1953, Lawton Braves of the Class-D Sooner State League from 1954 through 1957, Midland Braves of the Class-D Sophomore League in 1958, Eau Claire Braves of the Class-C Northern League in 1959, and Davenport Braves of the Class-D Midwest League in 1960. Jackson and his wife, Mary, had two children, Dorothy Fincher and William Travis Jackson, six grandchildren and four great-grandchildren. Jackson died of Alzheimer's Disease in 1987. Jackson was inducted into the Baseball Hall of Fame by the Veterans Committee in 1982. Despite his record and achievements, defensive standouts were overshadowed by power hitters in Hall of Fame balloting. He was also inducted in the Arkansas Hall of Fame. 1 2 Smith, Chester L. (March 9, 1934). "Giants' Faith in Travis Jackson's Knee Vindicated". The Pittsburgh Press. p. 45. Retrieved April 16, 2012. 1 2 3 4 5 Erion, Greg. "Travis Jackson". Society for American Baseball Research. Retrieved April 15, 2012. 1 2 3 4 5 6 7 8 9 10 11 12 13 McG. Thomas, Jr., Robert (July 29, 1987). "Travis Jackson, A Shortstop Who Made The Hall Of Fame". The New York Times. Retrieved April 16, 2012. ↑ "Travis Jackson Should Prove Good Utility Man For Giants in Series". Providence News. September 28, 1923. p. 13. Retrieved April 19, 2012. ↑ "Jackson To Succeed Dave". The Milwaukee Sentinel. Associated Press. November 13, 1923. p. 10. Retrieved April 19, 2012. ↑ "McGraw Staging Biggest Gamble in Young Jackson: Filling Shoes Left by Classy Dave Bancroft with 20 Year Old Boy". The Lewiston Daily Sun. November 22, 1923. p. 6. Retrieved April 19, 2012. ↑ Walsh, David J. (March 19, 1924). "Travis Jackson May Not Be Able To Fill Bancroft's Shoes Acceptably: Phenom Fails to Sparkle. Giants Will Be in Desperate Circumstances if Youngster Does Not Come Through in Style". The Pittsburgh Press. p. 27. Retrieved April 19, 2012. ↑ Farrell, Henry L. (April 7, 1924). "Thinks Giants Will Have Plenty to Worry About". The Toledo News-Bee. United Press International. p. 14. Retrieved April 19, 2012. ↑ "Young Shortstops Have Busy Season: Wright and Jackson Miss Few Games with Respective Teams in 1924". Ludington Daily News. Associated Press. December 31, 1924. Retrieved April 19, 2012. ↑ Mamini, Bob (December 12, 1946). "Johnson, a Baseball Legend". The Calgary Herald. Retrieved April 19, 2012. ↑ Rice, Grantland (March 3, 1931). "The Best Shortstop". The Milwaukee Journal. p. 2. Retrieved April 19, 2012. ↑ "Travis Jackson Under Knife; Lost to Giants". The Milwaukee Sentinel. Associated Press. April 2, 1927. p. 11. Retrieved April 16, 2012. ↑ "Influenze Epidemic Hits Three Players". Rochester Evening Journal. April 16, 1932. p. 9. Retrieved April 16, 2012. 1 2 "Jackson's Signed Contract Arrives at Giants' Offices". St. Petersburg Times. Associated Press. February 4, 1933. p. 2. Retrieved April 16, 2012. ↑ "Travis Jackson's Putty Knee Big Question Mark of World Series". The Milwaukee Journal. Associated Press. September 27, 1933. p. 4. Retrieved April 16, 2012. ↑ Gould, Alan (August 2, 1933). "No 1924 Echo". Youngstown Vindicator. p. 8. Retrieved April 16, 2012. 1 2 Gould, Alan (September 25, 1936). "Can Terry, Jackson Stand Series Gaff?". Lewiston Evening Journal. Associated Press. p. 14. Retrieved April 16, 2012. ↑ "Yanks Take Lead, Down Giants, 2 to 1". The Pittsburgh Press. October 4, 1936. p. 3. Retrieved April 16, 2012. ↑ "Series Highlights". Reading Eagle. United Press International. October 6, 1936. p. 16. Retrieved April 16, 2012. ↑ Gould, Alan (October 7, 1936). "Yankees Blast Giants 13-5 to Capture World Series Championship in Six Games: American Leaguers Chalk Up Seven Runs in 9th Frame, Murphy Rescues Gomez to Aid in Triumph for McCarthymen – Set Records". Youngstown Vindicator. Associated Press. p. 14. Retrieved April 16, 2012. ↑ "Giants Set to Buy Albany Franchise: New York Club Says Agreement Reached, But Owner Cambria Differs. Will Shift Franchise: Move to Jersey City With Travis Jackson as Manager Planned if Giants Acquire I.L. Club". The Montreal Gazette. Associated Press. December 30, 1936. p. 15. ↑ "Travis Jackson Back With Giants As Coach". The Montreal Gazette. Associated Press. July 16, 1938. p. 12. Retrieved April 16, 2012. 1 2 "Giants All-Time Coaches". MLB.com. Major League Baseball Advanced Media. Retrieved April 16, 2012. ↑ "Hartnet to Giants; Jackson is Retired". The Montreal Gazette. Associated Press. December 11, 1940. p. 17. Retrieved April 16, 2012. 1 2 3 "Travis Jackson Minor League Statistics & History". Baseball-Reference.com. Retrieved April 16, 2012. ↑ "Travis Jackson to Coach Giants". Pittsburgh Post-Gazette. Associated Press. October 15, 1946. p. 14. Retrieved April 16, 2012. ↑ "Travis Jackson Quits Smokers". St. Petersburg Times. Associated Press. July 2, 1949. p. 15. Retrieved April 16, 2012. ↑ Melcher, Ronald (June 24, 1951). "Travis Jackson Named Chiefs New Manager, To Take Charge Today: Oldtime Star To Boss Club From Dugout 'Stonewall,' Promoted From Bluefield, W. Va. Of Appalachian League Congratulations Can Be Returned To Travis Jackson". Hartford Courant. Retrieved April 16, 2012. ↑ "Travis Jackson Eau Claire Pilot". The Milwaukee Sentinel. November 27, 1958. p. 4. Retrieved April 16, 2012. ↑ Durso, Joseph (March 11, 1982). "Chandler, Jackson To Join Hall". The New York Times. Retrieved April 16, 2012. ↑ "Deserving Quartet Enter Baseball Hall of Fame: New Hall of Famers Travis Jackson, Happy Chandler, Frank Robinson, Hank Aaron". St. Petersburg Times. August 2, 1982. p. 1-C. Retrieved April 19, 2012. Wikimedia Commons has media related to Travis Jackson. "Travis Calvin Jackson (1903–1987)". Encyclopedia of Arkansas History & Culture. The Central Arkansas Library System. Retrieved April 12, 2012.